A mix of contemporary and cottage styles make this faux marble top round dining table set with metal base a fantastic choice for a bistro-inspired casual dining set. The metal upholstered side chairs offer comfortable seating as it adds appealing styling to your dining room, breakfast nook, or kitchen. The Hamlyn 5 Piece Round Faux Marble Top Metal Dining Table Set by Steve Silver at Walker's Furniture in the Spokane, Kennewick, Tri-Cities, Wenatchee, Coeur D’Alene, Yakima, Walla Walla, Umatilla, Moses Lake area. Product availability may vary. Contact us for the most current availability on this product. 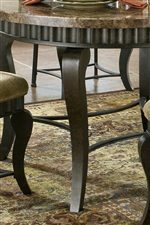 The Hamlyn Collection includes occasional tables, a casual dining set, and a 3-piece pub set, all of which feature marble laminate tops, metal bases, concave box stretchers, stylishly exaggerated cabriole legs, and unique inverse scalloping details. 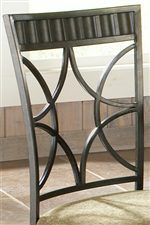 The occasional table collection includes end table, sofa table, and standard top cocktail table, all with rounded tops. Create a motif in your home by furnishing your living room with accent pieces from the same collection as your dining room furniture. 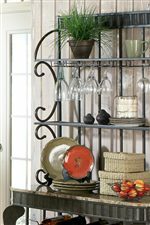 The casual dining set includes a round top table made to seat four, beautiful diamond lattice back side chairs with upholstered seats, and a baker's rack with scroll detailing, three shelves, and a built-in wine storage rack. The Hamlyn collection is a great option if you are looking for Traditional furniture in the Spokane, Kennewick, Tri-Cities, Wenatchee, Coeur D’Alene, Yakima, Walla Walla, Umatilla, Moses Lake area. 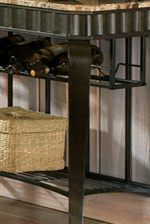 Browse other items in the Hamlyn collection from Walker's Furniture in the Spokane, Kennewick, Tri-Cities, Wenatchee, Coeur D’Alene, Yakima, Walla Walla, Umatilla, Moses Lake area. A head turn. Great price.